WHAT DOES A SUCCESSFUL KNOWLEDGE MANAGEMENT PRACTITIONER DO? Evolutionary Learning in Strategy-Project Systems explores the gap between the theory and practice of knowledge management in organizations and analyzes how learning happens and how knowledge is created. The authors take a practitioner-driven approach, one that unites organizational strategy with the learning of organizational lessons—the kind of knowledge management that enhances project performance and ultimately business success. 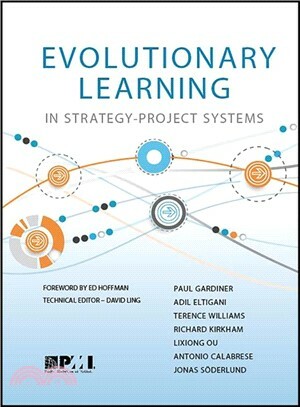 Through a survey of the literature and an analysis of original case-study research, Evolutionary Learning in Strategy-Project Systems develops a model of learning capability that proceeds exactly as its title implies, not as a line, but as a cycle—from codifying individual knowledge and putting it into practice within a context that values social relationships and networks. The conclusions offered in this book build on the rethinking of project management literature in today’s world—creating a strategy-project learning model that not only improves current knowledge capabilities, but also develops new ones. Antonio Calabrese is Associate Professor of “Industrial Plants” and “Industrial Plants Management” at Politecnico di Milano (Italy). He is Faculty member of the School of Management and Director of two masters degree programmes in project management offered by MIP, the graduate School of Business of the university: the MSPME (Master in Strategic Project Management European, for international students) and the MPM (Master in Project Management, for Italian students). Director of the MBA and Executive MBA programmes of the School (2013-2015) and of the Corporate Division (customized programmes for companies, 2010-2013), his main research interests are in project management and industrial engineering. Within project management he is mostly interested in project control, risk management, strategic project management, program and portfolio management, stakeholder management and the effects of cultural differences on the project success. Since 2006 he cooperates with some universities (Shandong University—China, Heriot Watt University—UK, Umea University—Sweden) both in master and PhD programmes. He is member of the Executive Board of IPMA Italy (International Project Management Academy—Italy) since 2008 and is the Editor of the IPMA Italy Journal of Applied Project Management. Reviewer at many congresses and chairman or co-chairman, he is author or co-author of 11 books and more than 70 publications. He consults for large, medium and small private companies in the field of management, project management and industrial engineering. Dr Adil Eltigani is an active academic with solid professional experience as a consultant in strategy, project management and quality management. He worked as a Research Fellow at the British University in Dubai. Adil worked as a Visiting Academic at the University of Manchester, in the UK. The main research interest focus on the micro-foundations of dynamic capabilities in organisations and also the learning processes in project and programme management context. Paul Gardiner is a Lecturer in the School of Management and Languages at Heriot-Watt University, Edinburgh, UK. Dr Kirkham is a Lecturer in Engineering Project Management. Prior to his appointment at the University of Manchester, he held the post of Lecturer in Quantity Surveying and Construction Management (Liverpool John Moores University, 2004-2008), Research Officer (School of Industrial and Manufacturing Science, Cranfield University, 2002-2004), and Research Assistant (School of Architecture, University of Liverpool, 2001-2002). He obtained a PhD in the application of stochastic methods in whole-life cost modelling at the University of Liverpool in 2002, and a BA in Construction Management in 1998. Dr Kirkham has published widely in the fields of whole life costs, stochastic service life prediction and quantitative techniques in performance measurement, and is co-author of two texts on building/engineering cost modelling. He is scientific secretary of CIB-TG62 Complex Systems and the Built Environment, and co-managing editor of RICS Research Innovation in the Built Environment. In 2005, Dr Kirkham was appointed as Visiting Research Fellow at the University of Liverpool. He is a Fellow of the Royal Statistical Society and immediate past-chair of the Liverpool Centre Chartered Institute of Building. Jonas Söderlund is professor in the Department of Leadership and Organizational Behavior at the BI Norwegian Business School. He is educated at IMIE, Linköping University, and Harvard Business School. Söderlund has been a visiting scholar at MIT Sloan School of Management and Cranfield School of Management. He has been a Visiting Professor at l'Ecole Polytechnique in Paris and at LUISS, Rome. Dr Söderlund has published 10 books and more than 50 articles.